Leave a deserted Kilmarnock, and within no time I'm in a deserted Stirling. A woman is feeding the pigeons. A spot of rain in the air. At Dunkeld, black-headed gulls swoop and glide. 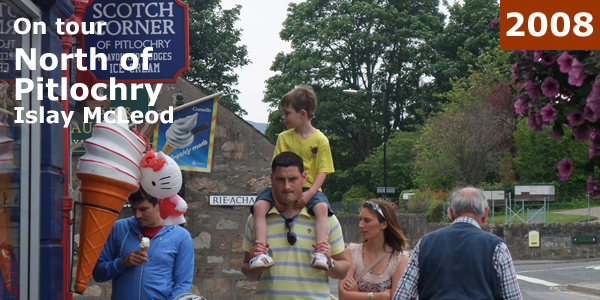 My next stop is another town bypassed by the A9 – a Pitlochry packed with tourists. Sandwich at the Cottage Tea Room – an old-fashioned café with a small dining area at the back of a tiny shop. I am content to sit writing notes until a neighbouring couple spoil the mood. The woman has been looking over at the waitress for some time – at first I wonder if she's glaring at me. Eventually she calls her over. Her coffee is cold and no scone has arrived. When she demands an explanation I feel embarrassed. The staff apologise and rush to right the wrong. But the woman says she has had enough and leaves – refusing to pay for anything. Head down the main street, going for a cold drink at the Kingfisher Bar. On my way in, a man sitting outside shouts over: 'Here you, whatever you're having, I'll get it.' After a forced smile and polite decline I quicken my step towards the front door. are silently sniggering at the tourist. My B&B is family-run. It's the night of the Euro 2008 final between Spain and Germany, and I'm asked to join the family at a local pub. I have work to do, but am grateful for the offer. Outside for my final cigarette of the day, I watch two boys on bicycles trying out various stunts. One manages to bounce his vehicle up to a two-inch-wide grey railing, and keep it there. Skilful, totally fearless – how on earth did he learn he could do that? when I get back to the car. His secretary tells me this isn't his area of expertise and I'm given the mobile number of Councillor David Alston, chairman of the Drugs and Alcohol Committee. Call him, leave a message – no reply by the end of the day – or ever. town – from a respectful lifeboat tribute to a ludicrous scene of Highland pipers. If ever a town flaunted its industrial heritage, it's this one. Leave the boring main road and go for a class-z instead. A single track takes me to the Falls of Shin. Leave the car to admire the foaming surge and am attacked by flies, buzzing at my face and advancing towards the open car window. Whoosh them out rather pathetically – it takes me five minutes to find the last critter clinging to my hair. So much for the Falls of Shin. For 38 miles, on the winding road from Lairg to Tongue, alone in a barren, beautiful wilderness, I quickly learn the etiquette of single track roads – for the best drive, let the locals past, then follow them. Tongue is bathed in a hazy afternoon sun for my arrival. Silence: utter silence. Still feel alone, but not lonely. Instantly want to tell others. Reach for my mobile. No reception. retreat to the local pub, The Brass Tap. Instantly love this tiny place with its dark wooden walls. Better still, it has a phone – and it works. A result! At last! Ullapool, 93 miles distant. Using public transport, including the post-bus, it will take him 10 hours, give or take the odd delay for mother goose. We reach Altnaharra, which has some of the most volatile weather in the UK and is often frequented by weatherspotters, a breed of enthusiasts I didn't know existed. Then tiny Crask. And when I say tiny I mean tiny – Crask has a population of two and consists of a small inn, a place of refuge for travellers stranded by blizzards. During a 15-minute stop at Lairg, I walk down to the waterfront. Not far from the shore there's the comical sight of a rock with a wee house on it. This is a long-running local joke – villagers take their boats out in the dead of night or at first light and add improvements. It currently has an extension, a couple of trees with hanging monkey, and a satellite dish. For the return journey, I have Sean, a trainee chef, for company. He uses the post-bus to travel to work in Melness every Tuesday, returning home with a friend on Sunday. Sixteen years old without any other means of transport, he doesn't know how else he would get to work. gorgeous beaches. Golden sand. Sun beating down. This is Scotland? I'm hoping to board the ferry to the most westerly point of Scotland. Just as the post-bus turns out to be a four-seater van, so the ferry is a small boat for eight. I'm excited by the prospect, but the tides are problematic and sailing for the rest of the day has been cancelled. I never did make it to Cape Wrath. Can't resist pausing at the untouched beach of Dunnet, which stretches for miles. The road to Dunnet Head takes me through an uninhabited world of still blue waters until a lighthouse welcomes me to the most northerly point of the British mainland. I'm drawn at once to a cluster of brick-built buildings abandoned since the second world war. Ignore the 'Dangerous - Keep Out' sign and peer in – almost unimaginably, this bleak place was once home to British servicemen. A jet streaks overhead from a local RAF base. Feel foolishly sentimental. Cry. Leave. Back to Scrabster in plenty of time to catch the ferry to Stromness. After a short walk, catch-up with R F Mackenzie's 'A Search for Scotland.' I love this book and am soon so engrossed I fail to hear the car engines ahead rev-up. The Orkney boat is boisterous. Three loud, severely drunk people make their way into the lounge area. Pray they do not select the table next to mine; pray in vain. Wherever I escape – be it the deck, restaurant, even the toilets – they aren't far behind. Drive around Stromness before making for my B&B. Amazed by the narrowness of the streets, almost reminiscent of the medieval lanes of Amsterdam. Receive a warm welcome from Kay and Neil Sinclair; instantly feel at home and appreciated. Share a rather large breakfast table in the morning with a family trio, the mother from Switzerland, the father from Germany, the son a bit of both! Bacon and eggs all round. Drive to South Ronaldsay, stopping off at the harbour of St Margaret's Hope. The village looks caught in time with its wonderful greystone buildings and walls. Decide to explore more remote areas and head south. An old man with hiking sticks is walking past a church. We get talking. His name is John Annal from Burwick. The church – St Peters – was closed years ago after the last local involved with it was buried. We chat about his life in Orkney. He was born here, loves the landscape and the way of life. Although he often visits his daughter in Edinburgh, and thinks Edinburgh is okay, he always longs to return to his homeland. Reach Burray, a small village not far from St Margaret's Hope, and speak to the local postmistress, Irene Sutherland, about the imminent closure of Burray Post Office. She is only 49, yet her livelihood is over. Burray is a developing village – why take this service away from the community? The great trio of rural communication was the church, the post office and the pub. At Burray, the church has closed; now the post office; how long before the pub too? Drive into Kirkwall and meet the managing director of Ortak jewellery. After a tour of the shop, offices and workshop I emerge with a new insight into the industry. As soon as you make your order, it goes through 27 stages of production. Another lovely afternoon. Travel to the north of the mainland of Orkney – passing through Swannay, across to Evie Village and beyond. premises not far from the Italian Chapel. He has a wine boiler called the Big Yin which amuses me. Even more when he tells me that the next will be the Even Bigger Yin. Misty morning; light drizzle. After checking-out, off to Kirkwall for a look around. The best streets are narrow and packed with shops – hidden behind the big hotels on the harbour front. I find a coffee and music shop – heaven! – called The Reel, run by local fiddlers, the Wrigley sisters. A double bass sits in the corner next to a black piano and the haunting lilt of a fiddle is playing in the background. Head north-west towards Skara Brae; arrive to find tour buses. On leaving the site, meet a Welsh couple from Cardiff – rejoicing in the name Jones – who stayed at the same hotel last night. Long discussion on politics, Scottish independence, Welsh devolution, oil prices and Gordon Brown, and agreement that we like to be connected to each other and to the English. After Skara Brae I buy my mum an earth-coloured jug from the Westray pottery and go to Brogdar. The stones – Ring of Brogdar – sit anciently on their hill. Try to take some quick pics before a coach of tourists makes its way over to spoil the view. Check-in at the ferry terminal. Three boys, barely in their teens, cycle manically past, shouting over to the queue of cars and passengers: 'Have a nice holiday, have a nice holiday' they cry, in a put-on attempt at Stephen Fry as the archetypal Englishman. Over dinner in my Wick hotel, working away at notes of the day, I fear I'm mistaken for a restaurant critic. I'm asked seven times during a one-course dinner (delicious locally-caught haddock – with the ubiquitous chips) – whether 'everything is all right, madam.' As I'm settling the bill, an attractive waiter with an Eastern European accent hands me a tiny glass 'with the compliments of the manager, madam.' Thinking it is a small dessert wine or ice-vine I knock it back in one. Whisky. Urgh. Sleep well. Wake up to another drizzle. 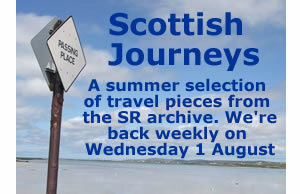 A long journey ahead, south-east to Macduff in rural Aberdeenshire, so leave early. Before long the commercial curse of the south starts to creep in. At Elgin, pass the first Burger King I've come across for days. Rural farmland. television and its remote control seem to be totally different brand makes – incompatible. The bathroom has no soap, no toilet paper. Escape to the car for a drive round rural Aberdeenshire following the stops of the old Great North of Scotland Railway – from Macduff to the junction of Inveramsay. Not one of the 10 stops exists any more and few have any remnants of station houses, tracks or platforms. I have read R F Mackenzie's description of the shack, Utopia, which once existed on the Inveramsay platform and where debate and discussion would continue long into the night. Yet nothing commemorates this amazing place now – not even a plaque. on the ground floor and I come across several young locals getting tanked up, screaming, laughing, one even crying when I go out for my final cigarette of the week. Return hastily to my room, finishing my notes to the highlights of Federer being beaten by Nadal on the dysfunctional TV. little to do and middle-aged men trudging about with their carrier bag of beer. am assured that fishermen are clever, hardy men, who will fight their corner. At Peterhead Port Authority, they tell me that boys once went to sea as young as 15. All they needed was a boat and the basics, usually passed down in succeeding generations of the same family. The authority would often help them to acquire shares in a vessel. With the introduction of quotas, this age-old custom was lost. One of the regular haunts of the fishermen is the Union Bar, a small basic pub almost as brown inside as it is out. Looks closed and uninviting, but I push the door and unexpectedly it opens. I speak to regulars at the bar. A deckhand called Sid says that the number of boats in his time has declined from 400 to 40. The quotas mean that few can afford to stay in the industry. The fishermen often throw back as many fish as they catch. At the Harbour Lights, I find an older crowd. Propped at the end of the bar I speak to a retired fisherman, Ian Baird, who entered the industry at the age of 15 and stayed with it for 39 years, following on from his grandfather and father. He sounds glum: thing won't improve; the fishermen have not been as well treated as the farmers; self-employed tax is a burden in January and July. Dinner in Banff, then return to the hotel in Macduff. After typing up notes, I head outside for some fresh air (i.e. the inevitable cigarette) and get talking to a group of electricians from East Kilbride and Easterhouse. They are working locally. 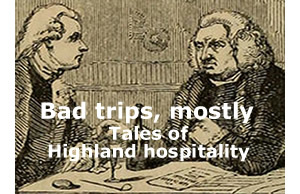 We have a great chat about international culture and politics, as people tend to do when they find themselves outside the Highland Haven Hotel, Macduff, after a close inspection of the menu. Leave early. Arrive at Pitlochry Festival Theatre to find my mother, father and dog, who 'just happened to be passing.' We have lunch in the theatre, catch-up. Tour of the theatre, meeting various members of staff, including a carpenter, scenic artist, head of stage and actor. My favourite place is the workshop, filled with sets, salvaged props from previous productions, tools and models. Tonight I'm staying in Knockendarroch House, where the theatre's founder, John Stewart, lived. The theatre started in his garden – in a tent! The only word to describe the place is magical. It stands proudly on a hill overlooking the town. With the theatre now more than a mile away from its origins and from the people of Pitlochry, I wonder how John Stewart would feel about it today. I get the bus to the theatre with four other guests from the hotel. One couple is Scottish and come to Pitlochry often. The other are on holiday from Washington DC. From the moment the red-ruffled curtains open and the first lines are uttered, I enjoy the play. After a rush of applause, the auditorium hushes. The story weaves its way through 18th and 20th century lives, leaving a powerful message. My interpretation is that we are all imminently doomed, so we should make the most of our capability to experience pleasure, even if that does occasionally involve dinner in Macduff. Almost get on the wrong bus, one bound for Edinburgh with nine Americans. It's dark outside and we all seem to be glad to return to Knockendarroch House. For me, it's the end of the road.